They are going to love to receive this bright and cheery Wine and Snack Gift Basket. 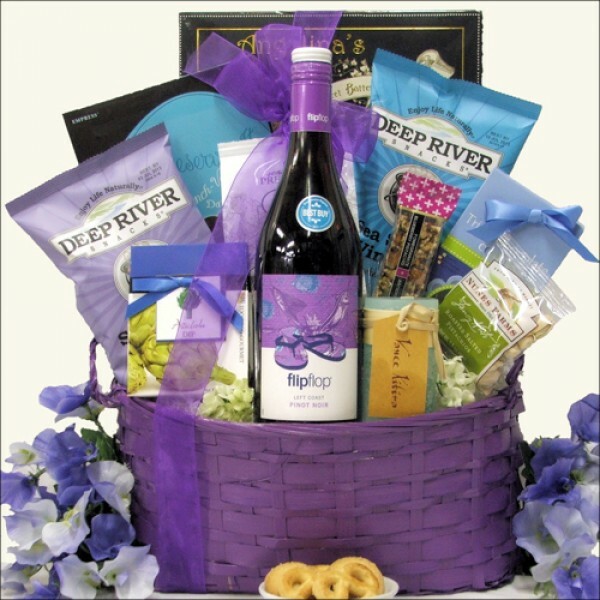 The Flip Flop California Pinot Noir Red Wine is the centerpiece of this beautiful basket which also includes Too Good Gourmet Triple Chocolate Cookies in a Flower Gift Box, Too Good Gourmet Artichoke Dip Mix, Deep River Salt & Vinegar Kettle Cooked Chips and more. These wonderful products are arranged beautifully in a Purple Bamboo Indoor Lined Planter Gift Basket. ...in a Purple Bamboo Indoor Lined Planter Gift Basket.